From walking on the sun-kissed beaches to swinging on the picturesque fairways, there is an array of ways to experience Cancun, Mexico. Popular sights, tourist attractions and hidden gems are always surrounding you. Find your inner adventurer as you hike along the Mayan ruins or immerse yourself in the exciting nightlife and dance the night away. With our Cancun vacation packages, your tropical getaway could be sooner than you think. Start off your vacation as you spread out on the cool white sand beaches and let the sounds of the rolling tides welcome you to paradise. With year-round sunshine and safe swimming waters, Playa del Carmen and Playa Las Perlas are the perfect places to work on your tan before enjoying the various excursions available. Explore the underwater world on a snorkeling tour, let the wind take control on a sailing trip, encounter nature on a eco tour or meet a new friend as you swim with the dolphins. In fact, Cancun is known for its world-class snorkeling and diving experiences. Take a short ferry ride to Cozumel, or enjoy a snorkeling tour along Akumal Beach, known for its beautiful coral reefs. 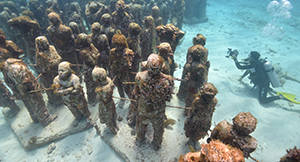 Satisfy your love of art and culture at the unique Museo Subacuatico de Arte, otherwise known as MUSA, located in the waters surrounding Cancun and Isla Mujeres. Blending nature with man-made sculptures, this hauntingly beautiful underwater exhibit is truly a one-of-a-kind experience. Let MUSA take your breath away as you scuba dive or snorkel through the art exhibit. Guests can also take in the awe-inspiring museum via glass bottom boats. 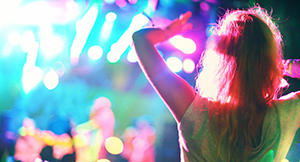 Discover all the fun and exciting nightlife Cancun has to offer. From live music venues to popular dance clubs, there is always a setting to celebrate. The party turns into a performance at the CoCo Bongo Show and Disco. This non-traditional nightclub hosts a cavalcade of entertainment – from launching soap bubbles and confetti to live bands and acrobatic showcases – for a night you’ll remember. Let the quiet serenity of the Yucatan Peninsula accompany you as you prepare your swing on one of the many golf courses surrounding the area. Feel immersed in the natural beauty at Cancun Golf Club at PokTaPok, boasting a scenic waterfront view and a course with real Mayan ruins. From drive to putt, Playa Mujeres Golf Club features an 18-hole golf course that is ideal for beginners and professionals. 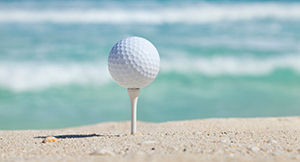 Whether looking to test your skills or enjoy some alone time on the fairway, you can easily work in a few swings while on vacation. Connect with nature while learning about the past at one of the various Mayan ruins located near the city. Hike through the Mayan city of Coba and feel immersed in ancient history, then explore the El Rey ruins, the closest site to Cancun famous for its beautiful scenery and reptilian inhabitants, iguanas. That’s just the beginning though. 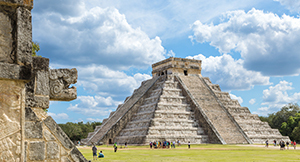 You can also take a day trip and visit the famous Chichen Itza. Its massive step pyramid, El Castillo, is an awe-inspiring sight that can be enjoyed both day and night. Then hike up the Ruins of Tulum and take in the awe-inspiring waterfront view where a refreshing sea breeze greets you at the top. Let out your inner Indiana Jones as you step through these historical attractions. Cancun’s beaches boast beautiful white sand that is cool to the touch and is created by the crushed coral and shells surrounding the Yucatan Peninsula. Cancun is home to the second largest coral reef in the world, The Great Mayan Barrier Reef. From 2009 to 2010, Cancun underwent a massive beach restoration project that added roughly 7 miles of shore and increased the width of the beaches by 40-70 yards. Cancun International Airport is the second busiest airport in Mexico and sees an average of 800,000 passengers a month. The airport is roughly 15 miles from most hotels in the city. 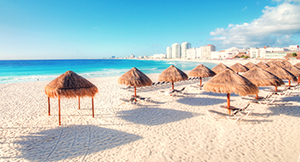 Cancun defines tropical climate with 60°F to 70°F as the average low and 80°F to 90°F as the average high year-round. While the peak of the sunny seasons generally range from early spring to mid-summer, Cancun continues to be the perfect vacation spot every season of the year. Because this paradise hosts tropical climates, it does have its share of precipitation, but it’s nothing that could ruin or rain on your parade.